We have had a terrible week around here. Jake came down with a cold early in the week, and then passed it on to both me and Nate. It’s not a terrible cold, but it’s bad enough to make us feel crummy and tired and sneezy. It’s been hard for all of us to get up and moving all week long, and I struggled through each day at work. My job is very communication-oriented. When people come to see me for a hearing test or for new hearing aids or help with their existing hearing aids, there is a lot of talking involved. It’s not just throwing them in a sound booth and pushing buttons. There is a history to take, and counseling to do. There is critical thinking involved. What is the patient telling me about their communication difficulty, and can I adjust their hearing aids to help them? When you’re off your game, it’s exhausting. So I struggled through my week. And Jacob struggled through his as well. It was curriculum night at the Middle School on Thursday evening. We had eight minutes in each of Jake’s classes, with five minutes to change between them. We were very happy with his teachers and classrooms – his homeroom teacher, who is his primary teacher, covering Language Arts, Reading, and Social Studies, is very energetic, dynamic, young, and male. I think we hit the lottery with that one. The band teacher is full of energy and excitement, and his science teacher is appropriately nerdy. Nate and I both came away very happy, but also a bit overwhelmed. Our feelings echoed those Jake had expressed earlier in the week. I knew he had been having a tough week, but had chalked it up to his cold. After curriculum night, I reevaluated a little bit. 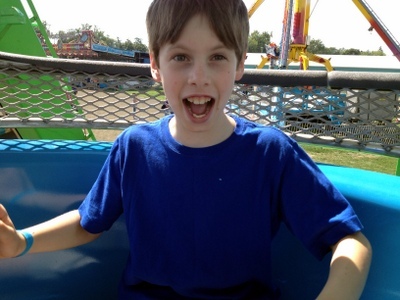 Yes, he is more tired than usual, and not feeling his best, but I have to acknowledge that the transition from elementary to middle school is difficult – maybe more difficult than I had anticipated. We are taking this weekend to lie low and recuperate. Hopefully next week will be easier – or at least less sneezy. The end of summer always brings change, but this year brings more change than most. Jake is starting middle school, and Aaron is starting Kindergarten. And I am starting a new schedule at work. That’s a lot for this mom to worry about. We ended the summer in our usual fashion – spending a million dollars and eating a lot of horrifying food at the Three County Fair. 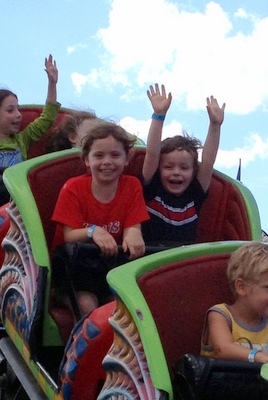 I was so excited to bring my camera with my new zoom lens to get tons of shots of the kids on rides. I took about 15 pictures before I realized that the words “No CF Card” kept appearing on the screen after I took a shot. I opened up the little door, and wouldn’t you know I had left the card sitting on the desk at home. So I sulked for about 30 seconds, considered going home to get it, and then I decided to pull out my iPhone and make the best of it. 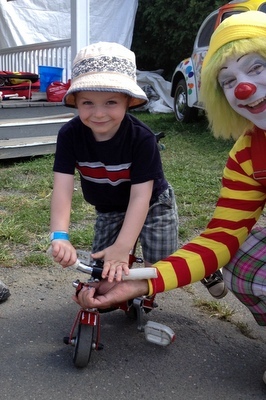 Aaron learning to ride the clown bike. Jake on the Ferris Wheel. 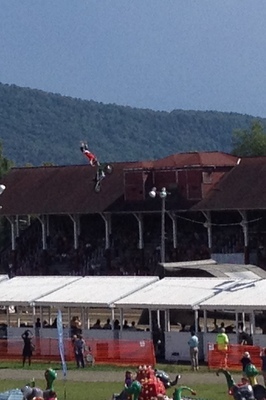 The motorcycle show happened to be going on while we were on the Ferris Wheel, so we got a bird’s eye view of the action. 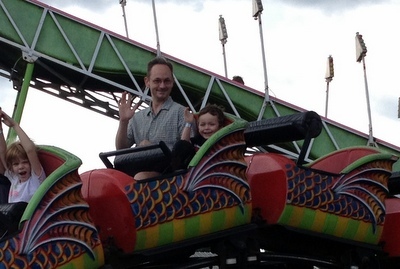 We saw the family circus, the alligator wrestler, visited the poultry and dairy barns, and of course, rode the rides. We ended up staying for an unprecedented 5 hours. That’s not a typo – FIVE HOURS. When we got home, I grabbed my book and just sat on the porch for an hour, enjoying the stillness. And then came Tuesday, and school started. The biggest change in store for us this year is that Jake now gets to ride the bus to school. And the bus comes at 7:20. Yes, 7:2o. I knew that getting him out the door at 7:15 would be no small feat, given that last year I routinely had to roust him out of bed at 8 o’clock. But Jake, being the kind of young man that he is, started practicing getting up early. He figured out how to set his alarm clock, and this week has beat me downstairs every morning. We cut it a little close for the bus the first morning, but other than that we’ve been doing really well. Aaron started on Thursday. I scheduled things at work so that I could take him and spend a little time in the classroom. 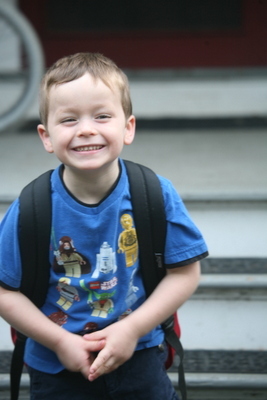 He didn’t seem nervous, and has been really excited about school. He had music class on Friday, and spent a lot of time that afternoon talking about it and singing the song that he learned. The other big change is for me – I’ve shifted my work schedule so that I start at 8:30 rather than 9:30. 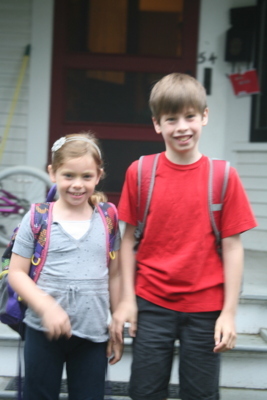 Since the elementary school doesn’t start until 9, this means that Lydia and Aaron are going to before-school care. I drop them off at 7:45 and then head off to work. While this sounds like a hassle – it’s actually working out well. Since Jake has to be up and out so early, we’re all up earlier anyway. Waiting until 8:45 to leave for school is just an extra hour of downtime in the morning that I would much rather have in the afternoon. So – I should be getting home from work around 4:30 now, rather than 5:30, which should (once we get into the rhythm of it), allow for a much more relaxed dinner and bedtime. That’s the idea, anyway. We’ll find out this week as we settle in.